Hail and well met! We are the Figures in the Fog and today we’ll be reviewing the new cards for Ashes: Rise of the Phoenixborn, added in The King of Titans . This is the first entry in this series. So, please allow us to introduce to you the King of Titans himself, the one and only Xander Heartsblood. Xander makes a bold appearance, touting a hearty 20 Life, 6 Battlefield, and a humble 3 Spellboard. This statline is identical to Noah, but hopefully, Xander can escape the same fate. Xander’s Phoenixborn ability is called Reincarnate. Reincarnate allows Xander to spend 1 Divine class die and a side action, to search his discard pile for an Ally and put it back into his hand. This effectively gives Xander the ability to the Ceremonial die power, without having to pay Life, and only using a class die. This is a very powerful utility effect, especially for Divine decks that use Allies. It can easily be paired with cheap Allies to continually recycle them over and over, like Anchornaut or Fire Archer, with minimal cost. This would also allow Xander to easily First Five a cheap Ally, and discard it at the beginning of the game to draw another card, effectively starting the game with 6 cards in hand and 9 dice! 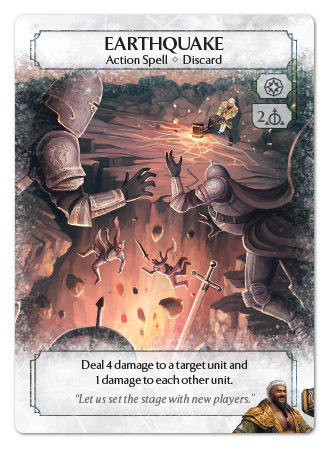 The other archetype this ability lends itself to, is a deck that relies heavily on keeping powerful Allies like Hammer Knight or Holy Knight on the Battlefield. With Reincarnate, Xander can always keep one of these behemoths on the field, without worrying about running out of Life. The two limitations on Reincarnate are it’s reliance on Divine magic, and the necessity of keeping Allies in the discard pile. Since the beginning of Ashes, the most powerful Allies have required Ceremonial magic, to synergize with Ceremonial dice power. Divine magic has relatively few Allies, (Holy Knight, Sun Sister, Celestial Knight) that a player would want to recycle. This is going to require players to build their decks to include enough Divine dice to reliably use Reincarnate, and enough of the other magic types to play their powerful Allies. The other limitation, is that the Allies must be in the discard pile, in order to be affected by Reincarnate. Fortunately, there are fewer effects that remove Allies form the game than remove Conjurations, Fade Away is the only neutral card and the other two are Phoenixborn signature cards: Silver Snakes (Maeoni) and Harvest Soul (Harold). X: Firstly I must say that the crew at PHG have incredible taste in names! But seriously, Xander looks great, both in the art and in the stats. I already have a couple ideas of using him in a Ceremonial, Divine, and Natural deck, to be able to play powerful Allies and have multiple ways of recycling them. I think he might finally be the Phoenixborn to enable the all Ally archetype. I don’t know if it would be any good, but it would at least be interesting. N: Reincarnate with Chained Creations is solid. It’ll only be relevant if things shift back into a big conjuration meta (or if that’s the meta you play in), but it’s solid. The flexibility offered by Xander’s ability is going to make him a dangerous opponent, but also very resource hungry. Dark Reaping is practically a must-have in him, and Gates Thrown Open may be another good choice, especially as he’ll likely be running a lot of allies. Xander’s signature card is a powerful Action Spell called Earthquake. For the cost of 2 basic dice and a Main Action, the spell deals 4 damage to a target Unit and then deals 1 damage to all other Units on the Battlefield. This card definitely passes the signature card test, if this card wasn’t a signature card would it be included in most other decks. At 2 basic dice, it trades evenly with all 2 dice Units and favorably with many 3 dice Units. This is good, but then second effect of the card is a bit more mixed. Dealing 1 damage to each player’s Units, can be both beneficial and detrimental, depending on the board state. This type of effect pairs well with both cheap low Life Allies like Anchornaut, or Fire Archer, that can easily be recurred and used again, or with beefier Allies with higher Life totals, like Hammer Knight, Sonic Swordsman, or Celestial Knight. Some Allies like Leech Warrior could even turn the drawback of being dealt damage into a benefit of taking an opponent’s die. X: Earthquake is good, albeit a bit difficult to get great value out of. In a well crafted deck, in a skilled player’s hand a well timed Earthquake can be devastating. But most of the time, it’s likely to be an cheaper Molten Gold, that also pings every other Unit. But much like any Spell that targets a Unit, it can be subverted by Angelic Rescue, so it will have to be carefully timed. And unlike, Molten Gold, it deals damage which means it can be blocked using Particle Shield or Protect. The trick is going to finding a deck that can take advantage of the damage on opponent’s Units while mitigating the damage done to your own. A combo that comes to mind immediately, is to play Earthquake on their big Unit, and then use your now damaged String Mage’s Exchange Link 1 ability to kill off an enemy 2 Life Unit. N: I really like the trade-offs of this card. It’s great value for 4 damage to a unit, but the 1 to everything else means careful timing is required. Well crafted decks should be able to turn the damage against themselves into an advantage, and I like those kind of creative deck-building opportunities. Overall, Xander is a welcome addition to the list of Phoenixborn of Argaia. While he isn’t bringing any crazy new mechanics, he has an interesting mixture of high impact utility effects, with a very reasonable statline. The biggest weakness of Xander is his limited Spellboard, but with the Reincarnate ability, Xander can effectively turn Allies into Conjurations. This will allow him, to get by with maybe a single Summon Ready Spell, instead of the typical two. But against Harold, and to a lesser extent Maeoni, his reliance upon Reincarnate to keep Units on the Battlefield could be easily disrupted, by removing key Allies from the game. And that’s it, for today at least. Plaid Hat should be releasing another article soon, revealing some more of the King of Titan’s powerful abilities. Until then, why don’t you tell us what you think of Xander Heartsblood and his powerful signature Spell? Will his enemies quake in fear, or do you think this King is not all he claims to be? Let us know in the comments below. Know that while we must Fade Away now, the Figures in the Fog will return soon. Edits: In a previous version of this article, Xander was compared to Brennen in terms of similar statlines. 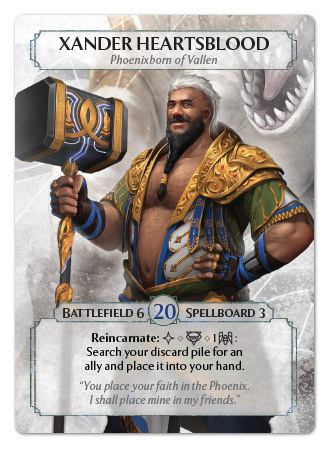 Due to Noah’s relative absence in the competitive scene, he did not come to mind when comparing Phoenixborn. Additionally, for similar reasons, Fade Away’s ability to remove Allies from the game was also overlooked. A big thanks to Jason Pere (author of FlAsh Fiction) for bringing these to our attention. If you guys aren’t up to date on his excellent storytelling in the world of Argaia you can find it here on Strange Copy.